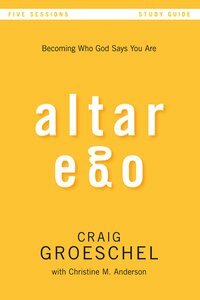 In Altar Ego, author Craig Groeschel shows individuals and small groups how to abandon self-worth based on accomplishments and possessions, turning instead to the eyes of God to define them. Participants will learn to expose false labels and selfish motives as the roadblocks they are, going instead to the altar of God's truth and pursuing the higher values he sets above the world. You don't have to get caught up in your self-worth or lack thereof. Your worth is not based on your opinion of yourself. You are valuable because God says you are His. You are not your past. You are not what you did. You are not who others say you are. You are who Christ says you are. This study guide offers discussion questions and other supplemental material to delve further into God's divine plan, and will ultimately help you sacrifice any old, unhealthy, untrue, and unbiblical thoughts about yourself and introduce you to your altar-ego-who you are in Christ. Designed for use with Altar Ego DVD 9780310894933 (sold separately). About "Altar Ego (Study Guide)"